Exploring Marriages and Families, 2/e by Karen T. Seccombe illustrates the ways in which historical, cultural, social, and political factors influence readers’ decision making in relationships. Grounded in theory and the most up-to-date research, this title takes an integrated focus on assessment helping readers gain a better understanding of the social context in which they live and the relevance of social science to their lives. MySocLab is an integral part of the Seccombe learning program. Engaging activities and assessments provide a teaching a learning system that helps students see the world through a sociological lens. With MySocLab, students can develop critical thinking skills through writing, explore real-world data through the new Social Explorer, and watch the latest entries in the Core Concept Video Series. Karen Seccombe is a professor in the School of Community Health at Portland State University, located in Portland, Oregon. She received her B.A. in sociology at California State University, Chico, her M.S.W. in health and social welfare policy from the University of Washington, and her Ph.D. in sociology from Washington State University. Her research focuses on poverty, welfare, access to health care, and the effects of social inequality on families. She is the author of Marriage and Family: You and Society (Pearson); “So You Think I Drive a Cadillac?”: Welfare Recipients’ Perspectives on the System and its Reform, 3rd edition (Allyn and Bacon); Families in Poverty (Allyn and Bacon); Just Don’t Get Sick: Access to Health Care in the Aftermath of Welfare Reform, with Kim Hoffman (Rutgers University Press), and Marriages and Families: Relationships in Social Context, with Rebecca L. Warner (Wadsworth). She is a National Council on Family Relations fellow, and a member of the American Sociological Association, and the Pacific Sociological Association, where she has held elective offices. Karen lives in Portland with her husband Richard, a health economist, her ten-year-old daughter, Natalie Rose, and her eight-year-old daughter, Olivia Lin. In her spare time she enjoys hiking near their cabin in the Oregon Cascades, walking the sandy beaches of the Oregon coast, exploring the kid-friendly playgrounds, attractions, and restaurants in Portland and surrounding areas, and traveling just about anywhere—the San Juan Islands are high on her list. 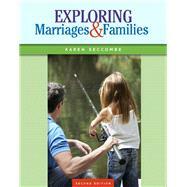 Chapter 1: Why Study Families and Other Close Relationships?